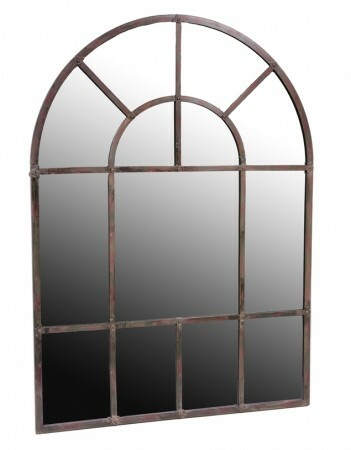 This is a well made arch top metal mirror. It is intentionally distressed and the metal has a brown and green hue where the paint looks chipped and crackled in places. It has a pleasing aged and antique feel about it. Nice rivet details on the panel joins. Not suitable for outdoor use and the backing is made or hardboard. Dimensions: 80cm wide × 4 × 110cm tall.